May 1, 2013 by LindaJoy Rose . Posted in " Condiments, Featured, Health, Miscellaneous, Nutrition, Petit Plats, Raw Fusion Solution, Recipes, Sandwiches, Tips & Tricks, Weight Loss " . 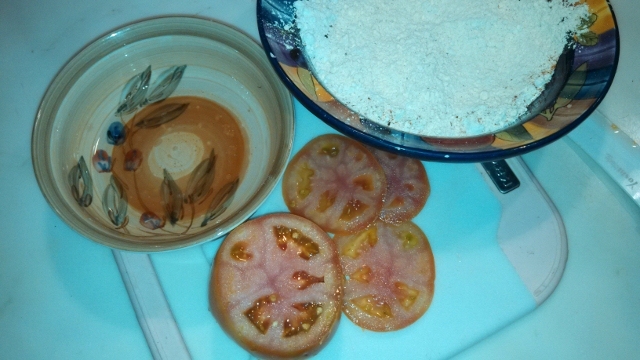 Tags " chickpea flour, fried green tomatoes, healthy fried green tomatoes, oat flour, umeboshi vinegar " . I grew up in the midwest and spent over 25 years in Souther California so “Fried Green Tomatoes” was not something that you would see on a menu. Once the movie came out, I was very curious to try them. Who doesn’t love fried food? There is something utterly delicious about eating foods that have been battered and deep fried. Having indulgence days or meals is definitely part of the Raw Fusion Lifestyle — I love the seasoned sweet potato fries at our favorite waterside eatery in beautiful Tampa Bay, but fried foods should be kept at a minimum in anyone’s diet. Frying causes crucial molecular changes in the food which can damage cells and break down collagen in the skin, accelerating the aging process. I used some ingredients that I have on hand, but there are a lot of options for the “breading.” Brown rice flour, gluten-free all purpose flour, organic cornmeal (would be very yummy but I have a strong sensitivity to corn products of any kind) almond flour — anyone of those can replace the oat and chickpea flours used in this recipe. Chickpea flour (besan) can usually be found in health food stores, in the gluten-free section, or in Indian markets. It is not a raw item. So, to make this recipe complete raw, try using almond flour instead. The two “stand out” ingredients in this recipe are the umeboshi vinegar and the cayenne pepper, both of which added a lot of extraordinary flavor. Umeboshi (also spelled umebyoshi) comes from Japan; it’s a combination of sour salted plums, sea salt and shiso leaves and the resulting vinegar is sour,, salty and a bit fruity. It is one of the most alkalizing ingredients on the planet (one of the recommended pantry items for our “food group therapy” Alkalinity Challenge) If you are sensitive to soy products try using this vinegar as a substitute. You can replace this with brown rice vinegar or any other you have on hand, too. Cayenne pepper gave it just the right spicy kick. 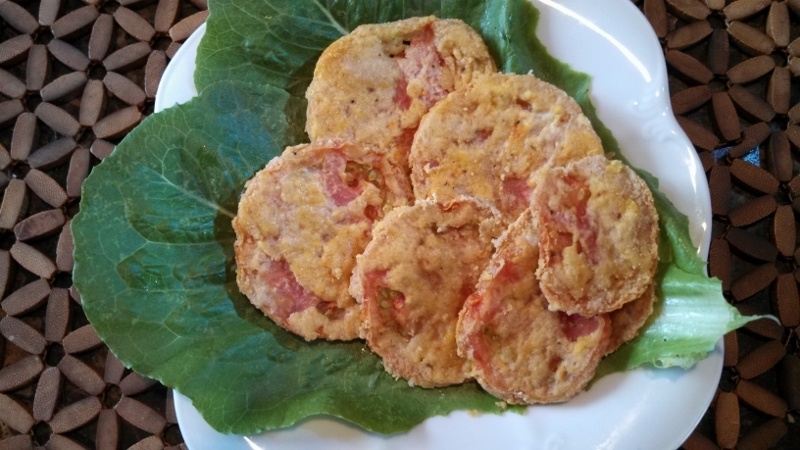 Healthy “UnFried” Green Tomatoes — the Raw Fusion Way! Directions: Slice the tomatoes into medium thickness slices. In a bowl whisk together the oil and vinegar. In a separate bowl or plate, sift together the flours and spices. Coat with the oil mixture and then dredge in the flours. Place on a teflex sheet or parchment lined cookie sheet. I made mine in the dehydrator, starting them at 145 degrees for 45 minutes then lowered to 115 for another hour. Then turn them over for about 45 more minutes. If you over-dry them they taste a bit too floury. You can bake them in a low temp oven – they probably won’t be fully raw but they still will be good for you! *Oat Flour – you can buy oat flour at the health food store. I make my own by buying raw oat groats (bulk section) and soaking them overnight and sprouting for one day. Then I dehydrate them until fully dry and process them in the vitamix or food processor to make flour. This is a lot of extra work but you are assured of a healthier, nutrition-packed natural flour. SERVING SUGGESTION: I rolled mine up in those lovely fresh organic romaine leaves pictured above, with sliced cucumbers, sunflower sprouts and another splash of umeboshi vinegar. Would also be nice with some fermented beets or pickled red onion. Magnifique! If you enjoyed this kind of “healthy indulgence” dehydration magic recipe, you may want to check out these luscious and Guilt-Free Jalapeno Poppers! 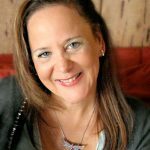 For daily tips, tools and techniques and wonderful “Recipes for Life” please like us on Facebook! In "Raw Fusion Solution, Snacks, Sweets, Tips & Tricks"